IMAGE: Liffey Cycle Route option 6 route overview: The routes for buses (orange), general traffic (red), bicycles (blue) and a new short boardwalk between Queens Street and Church Street to accommodate pedestrians on the river side of this section. Option 6 is a combination of “Section A Option 1 – Limited Boardwalk” and “Section A Option 3 – Bus Croppy Acre” (both mapped here, although in needing of some tweeking). Option 6 would be a merger of Option 1 and Option 3 at Queens Street / Mellows Bridge. Section A runs between Parkgate Street to Smithfield — the overall route would continue as a two-way cycle path to the Point Village / the East Link Bridge. With Option 6, a boardwalk would be provided between Queens Street and Church Street to accommodate pedestrians on the river side of this section, but unlike in Option 1, the boardwalk would not interfere with Mellows Bridge (which has been deemed unaccetable due the history nature of the bridge and to preserve built heritage). Option 6 offers better bus priority than the now abandoned Option 3 (abandoned because there’s an apartment complex blocking the planned bus detour route via Smithfield). Option 3 had used the busy and complex quays / Church Street junction to bring buses from a detour on Benburb Street back onto the quays. While Option 6 uses the turn from Benburb Street to Queen Street, which is easier as Queen Street is one-way (southbound) and Luas priority here will also act as bus priority here (buses will turn into and Luas cross over Queen Street at the same time). Queen Street and its junction with the quays is far less complex — there’s only west-east traffic (no turns) and north-south traffic (only left turns with turning lane). This simpler junction arrangement allows for easier bus movements and makes it less likely congestion will block buses. If needed, the left turn from Queens Street to the quays can be restricted to buses, and the new Luas / bus junction at Benburb Street can be kept clear using red light cameras (as used at Blackhall Place). This allows for the position of the cycle path to come right up to east side of the junction (shown here to the right of the junction). But there may be issues with the tightness of the corner for buses turning from Queen Street right onto the quays — if this example cannot accommodate buses turning, some variation of examples B or C outlined below will work. We can think of other alternatives which may in some ways be better than Option 6, but overall Option 6 is the best we have so we’re mainly suggesting this. Option 6 isn’t perfect, it includes compromises (even for cycling) and won’t keep everybody happy (no route will). But we’re not just plucking this idea from nowhere, Option 6 is the best of both worlds based on merging two different route options which consultants and the city previously worked on. Would it be possible for the 2 way cycle lane to flip to the South Quays between Blackhall Place and Church Street. That way it avoids the narrow 2 lane section on the north Quays. It mighe even make sense to keep going to the bridge at WineTavern St/Chancery Place as that’s one-way northbound and might give a better interaction with traffic. How likely are the council to consider this option? When does a final decision have to be made? I’m confused as to which bit is Croppies’ Acre and which is Croppy Park but the previous route was characterised as “wrecking” the one and “destroying” the other so you can expect push back from whoever was behind those posters. Note for people that aren’t aware, that artists impression of the riverside park shown above is what they are complaining about. 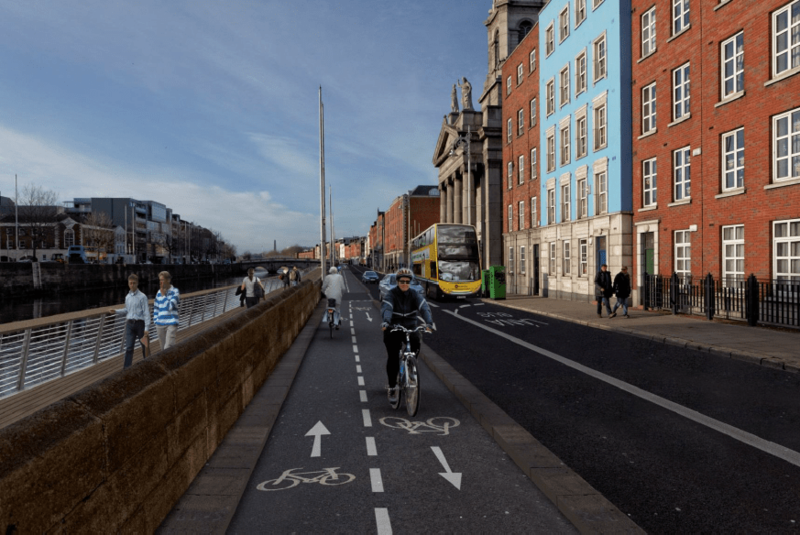 “highly compromised backstreet detour” vs “major and iconic … public perfered route” – could irishcycle drop the emotive language somewhat? ‘detour’? The new route is 60m north of, and parallel to, the proposed option 3. From a pure ‘Desire Lines’ viewpoint, many cyclists are already using the LUAS red line as a route across the city, trams being much less of a risk than cars and trucks on the quays. ‘compromised’? It could allow for completely segregated cyclepaths and better/safer/simpler junctions with traffic than would be available on the quay’s bridges (turning traffic). ‘public preferred route’ – where ‘public’ were the readers and referrals of cycling websites – the local advisement of this route was very poor, and public there put in their objections as they are allowed. Option 3 has its merits, but I still see it as greenwashing of a major road project in the west quays, and it’s cycle route, although better than current practice, still would not pass my ‘let my wife/kids cycle there’ safety test. What exactly about option three would prevent you from from letting your wife or kids cycle there? Exactly how would Option 5 be better junction wise? It would have 11 junctions in the same space as a quay-side route would just have 5. Option 5’s minor junctions could be more riskier for a two-way cycle route as two-way routes are not recommend for this reason when you have so many junctions in such a short space, and the sight-lines for these junctions would be compromised. And, yes, it’s a detour, the two-way north quays path was a compromise to serve both the north and south quays without affecting other modes too much — moving another 60m from the quays is adding to the distance from the southside. There is also likely to be significant delay in getting on-and off the detour when crossing from the quayside at the Four Courts over to Church Street and into Smithfield. 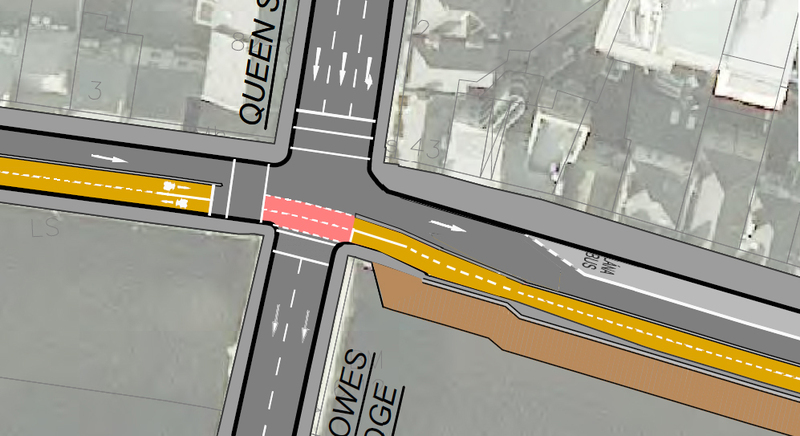 Then we have the pinch point in Smithfield, how does a two-way cycle path get around that? An upcoming post will cover these and your other issues. How is this diverted route going to encourage cyclists of all ages and abilities to use it ? The public are definitely getting what they asked for, regardless of the council’s inability to factor in the appartment block or not. There seems to be a huge reluctance here to inconvenience any mode except bicycles. Despite this ongoing madness, cycling numbers are gradually increasing. Can you imagine the far more rapid growth if there was some realistic investment in proper infrastructure ? > Exactly how would Option 5 be better junction wise? If the route is cycle only, then each intersection would put one cyclelane and one vehicular traffic route at right angles with a clear distinction. Option 3 on the quays would have one cycleroute, a parallel vehicular road and perpendicular roads at each bridge junction. I see this as being less safe, due to turning traffic and the rise/fall at each bridge. So it’s a further detour, not just a detour from Option 3’s detour? I think people will happily spend a few more seconds ‘detouring’ on a bike if they can take advantage of a quality route – I do so for the canal. That is why this route needs to be apable as possible, not just one with the best scenery. > What exactly about option three would prevent you from from letting your wife or kids cycle there? The Croppies end would be beautiful, I can see the merit but the placement of the proposed cycleroutes alongside the still busy quay road (that is not being reduced in size even though traffic has to be calmed/reduced in advance of Luas Cross City), would discourage me from advising they use it. Cycling beside a LUAS (as they can do now) is more relaxed – cars tend not to take as many stupid moves here when they risk getting rammed by a 100ton tram. I do want to see better cycling facilities, but not as a fop to road maintenance. This is a nice argument to be having (which major route will be best) but none of these options will be perfect and there will have to be compromise, but starting at the wrong place IMHO (Option 3) won’t get us to where we need to be. In the video it said that buses were going to be put on the same route as the Luas, but Dublin Bus didn’t like this (no doubt for good reasons) so the cyclists were given the shaft instead. As Kevin says, cyclists come last every time. I don’t think large numbers of cyclists should be directed onto Luas lines. It’s far too uncomfortable trying not to slip on the tracks in the wet or get stuck in them. Cyclists really have to play second fiddle there. 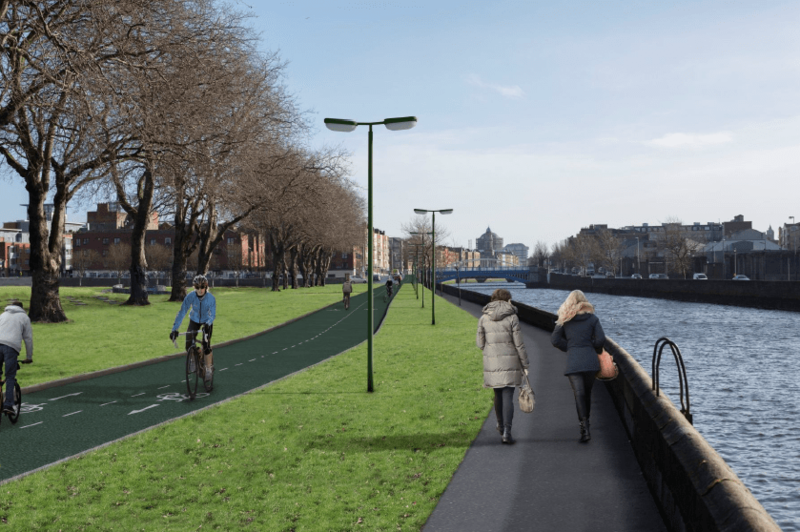 Regarding the discussion about a further diversion to a diversion (for people coming from the south side of the Liffey), I’d be peeved if I was one of those south-side cyclists, that I’d have to go even further north to get to a segregated cycle track. Yes, depending on the day, I might, but once again, cyclists getting the shaft. Why not just ban cars from the city center entirely and then no new infrastructure will be needed. Lots of money saved, no pollution, no noise, no deaths etc etc etc. Yea, right, I can see drivers and the motocracy accepting that. My dream is that only buses (no taxis!) and bicycles are allowed on the quays between Heuston and Custom House. Cars do no longer belong in city centres and they frankly should be discouraged and inconvenienced as much as possible. A city centre should priotise pedestrians, then cyclist, then public transport and if there is still some space, allow a limited amount of cars in. It works in many European cities so why not in Dublin? If cyclists are forced to share the road with Luas tracks are we going to see more of the following (see link below) where a guy in the UK slipped on the tram tracks and was killed by a following bus. I’m an experienced cyclist and I hate those tram tracks and will go out of my way to avoid them. How do less experienced cyclists feel about them and will it prevent people from getting on their bikes? From that article, in the 2nd paragraph – “De Klerk had thin racing-style tyres with no grip”. In the 14th paragraph – “It has left me in no doubt that the tram lines are the cause of the problem here”. Apparently it is illegal for cyclists to go along that route at the moment. Presumably this is for safety reasons or to prevent delays to the Luas. I don’t see any mention of what the council plans to change so that whatever reason for blocking cyclists before is no longer relevant. I’d be interested to hear an explanation as to why cycling along there was wrong before, but is now fine. Yes, I’d also be interested in the reasoning behind why it’s now deemed acceptable to allow bikes along the Luas tracks. Make it up as you go along perhaps? So I’d hate it if DCC offered up a band-aid solution requiring cyclists to use Luas tracks instead of providing a decent, segregated bikeway as originally planned. At the same time, it’s ridiculous to prohibit cyclists from using the Luas tracks here. If the road is paved, cyclists should be allowed to use them. If they don’t want cyclists using them, they should be open tracks (or covered in grass, which is nicer to look at). My guess is that it’s to avoid perceived delays to the trams, rather than safety, as you can cycle on them in other parts of Dublin — yet I wonder did they really measure whether trams would actually be held up by cyclists? I don’t think they would. Especially if there’s a quality bike route on a parallel route — the numbers of cyclists on the Luas route wouldn’t be so high. The danger of cycling on tram tracks is overstated. Here in Brussels people cycle over tram tracks every day and it just doesn’t seem to be an issue for anyone. If you approach the track at a 30 degree angle you’re fine. You can take it at 45 degrees if you’re really cautious. Obviously razor-thin racing bike wheels require appropriate care. But it’s just not necessary to be any more cautious than that and I think this like everything else bike-related in Ireland is “dangerised”. But for the purposes of this particular battle, I agree that DCC should just do what it said it would do and build the damned riverside route — and if keeping cyclists off the Luas lines helps make this case, then fine. Cian’s Option 6 is a sensible compromise and they really have no excuse not to adopt it. @tdlegge – Do the the tracks in Brussels have rubber safety inserts? That would make them a lot safer. @Citizen Wolf — not rubber inserts that I’m aware of. There’s no need. There must be hundreds of km of on-street tram tracks here and no one seems to have a problem cycling around and through them. @tdlegge – thanks for confirming a point I was going to make. I’ve been cycling for decades on the quays, and the LUAS tracks as soon as they were built, and I know which are actually safer. A little practice and avoiding the slot becomes second nature. The LUAS red line is not some magical route, it is used daily by cyclists and emergency services. For high cyclist numbers, where overtaking etc is common, I think the tracks could cause problems. Also, the perception of danger would prevent many using them, so I think this suggestion should definitely be challenged.